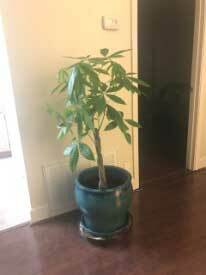 A couple of weeks ago (a few weeks after its final leaves had fallen), I took the plant out of the pot to discard it and transplant a new money tree plant in the pot. I saw the roots of the dead plant were skeletons (nothing to them) and noticed a few, what look like rolly polly bugs (smaller) around the roots (pill bugs maybe?). I discarded a majority of the dirt in the center of the round, 14″ diameter pot, set the new plant in, along with much of the dirt from the new temporary pot to fill the void. A few days later, I noticed there were about a half dozen of these bugs slowly working their way around the surface of the dirt. 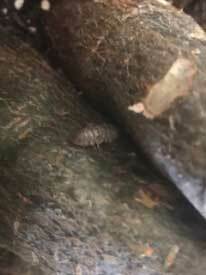 I googled and compared pics and think they are pill bugs. I went back to Lowes where I got the new plant and was told I didn’t need to throw away the old dirt from the pot and replant the transplant in new soil. I was told I could spray some insecticide on the dirt and then again in a couple weeks, that it wouldn’t harm the plant and would end the pill bug problem. I bought Natria Insect, Disease & Mite Control and sprayed it 5 days ago. This evening I stalked and dug out a half dozen pill bugs that were worming their way around the top soil. On a side note, I gave the plant a good watering at transplant (there were probably bugs in the soil then, but they were not visible) and let the water drain and am now watering when the soil no longer feels damp (this time around it was 13 days). I water until a little bit of water begins to drain out the pot hole. The pot dirt level from bottom to top is about 11 inches and the plant itself is about 37 inches tall. What do I do now? Do you think I should get rid of all the old dirt and retransplant again with fresh dirt? What about Diatomaceous Earth, is that a possible solution (keeping the soil as is)? I am concerned the bugs will feed on this weakened plant that has just been transplanted. It would appear that the source of the pill bugs was the soil from the dead Money Tree. It is also possible that more were introduced with the new plant from Lowe’s although there is no way to tell because you used the contaminated soil from the old plant when you repotted the new plant. I have several observations for you. First, new plants should not be repotted. They should be left in their original soil and in their original plastic pots which can then be set inside of a more attractive ceramic pot. Second, never re-use soil from another plant. Third, if you do need to use fresh soil, use only a soilless, peat-based potting mix that is sterile and pest free. Garden soil and dirt should only be used outdoors. If you left the original rootball of the new plant intact before you repotted it, then you can easily undo the repotting and remove all of the soil you added while leaving the original rootball intact and putting it back into its original pot. That will probably eliminate all or most of the bugs. Otherwise, you will have to find a SYSTEMIC pesticide that is poured into the soil. Make sure the label says it will work against pill bugs and other crawling insects. One thorough drenching with a systemic pesticide should be sufficient. I do NOT recommend trying to replace all or most of the original soil. Diatomaceous Earth will not be effective, nor will the Natria product that you used.